German novelist, lyric poet, and dramatist; born Aug. 4, 1817, at Zauditz, Silesia; died March 28, 1901, at Berlin. He first attended the Jewish parochial school at Gleiwitz, and at the age of eight revealed his superior poetic gifts in the poem entitled "Der Judenkirchhof." Ring next attended the gymnasium at Oppeln, Silesia, and later the universities of Breslau and Berlin. Graduating as M. D. in 1840, he began the practise of medicine at Gleiwitz. Upon the outbreak of an epidemic of typhoid in Upper Silesia, Ring found an opportunity not only to exercise his skill as a physician, but also to describe effectively in verse the unspeakable suffering and misery prevailing at that time among the people of the province. Although most of his writings were suppressed by the censor, the poem addressed to the king in behalf of the sufferers was afterward published. In 1848 Ring removed to Breslau, and thenceforth devoted himself assiduously to literature also. At the request of the publisher J. U. Kern, he wrote his first novel, "Breslau und Berlin," which became the inspiration of Gutzkow's masterpiece, "Die Ritter vom Geiste," and brought the author into contact with such literary celebrities as Berthold Auerbach, Robert Giseke, and Theodor Mundt. Ring achieved his first success as a dramatist in the comedy "Unsere Freunde," and his second, in the drama "Ein Deutsches Königshaus." He was also a very active contributor to the "Gartenlaube," and, from 1863 to 1865, when that publication was prohibited in Prussia, he conducted a separate edition of it in Berlin, under the title "Der Volksgarten." In 1856 he married Elvira Heymann, daughter of the publisher Karl Heymann, and in 1862 discontinued his medical practise in order to devote himself to literature exclusively. The following are a few of the principal novels and romances written by Ring in the course of a literary activity extending over fifty years: "Die Kinder Gottes," Breslau, 1852; "Der Grosse Kurfürst und der Schöppqenmeister," ib. 1852; "Verirrt und Erlöst," 2 vols., Gotha, 1855; "Rosenkreuzer und Illuminaten," 4 vols., Berlin, 1861; "Das Haus Hillel," 1879; "Berliner Kinder," 3 vols., Berlin, 1883. In addition to these he wrote many miscellaneous works, including: "John Milton und Seine Zeit," Frankfort-on-the-Main, 1857; "Berliner Leben, Kulturstudien," Leipsic, 1882; "Die Deutsche Kaiserstadt Berlin," 2 vols., Leipsic, 1882-84; "Das Buch der Hohenzollern," ib. 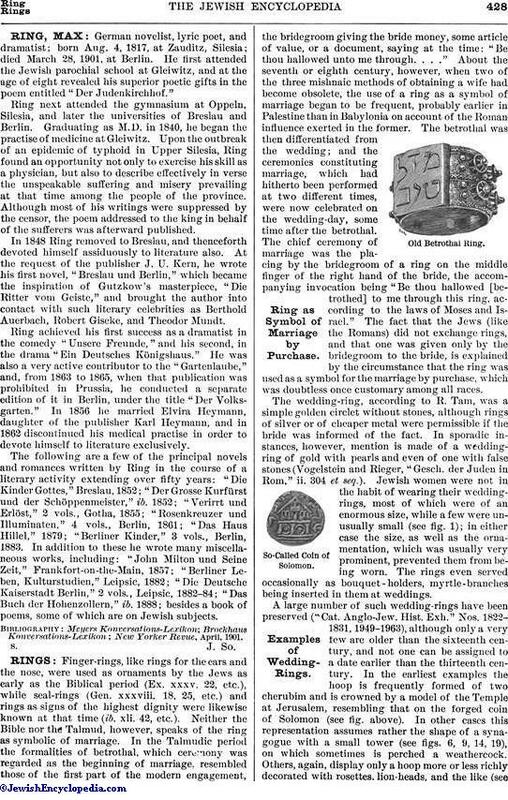 1888; besides a book of poems, some of which are on Jewish subjects. New Yorker Revue, April, 1901.